Hey...your chocolate's in my PEANUT BUTTER! No...your peanut butter's in my CHOCOLATE! Does anybody remember those commercials? I totally loved Reese's Peanut Butter cups when I was a kid. Okay, maybe I still do. Maybe. I mean come on, peanut butter and chocolate is a classic combination! I remember my mom loving the crunchy ones...and as a kid, I was was like ewww. But as I got a little older, I decided I loved 'em, too. And now, I can't even find the crunchy ones anymore! But I can find endless variations...the Big cup, dark chocolate cup, white chocolate cup, reverse cup (pb shell & chocolate filling...gag me), mixed nut (I actually liked this one)...and then there's the whips, wafers, crispy crunchy, clusters...oh, and let us not forget the egg, tree, heart and other various festive shapes for the holidays! I admit, I always buy an egg when they roll 'em out. But the classic cup is still my favorite. I don't think it's a bad thing to buy a candy bar every once in a while...so long as it's not a daily...or even weekly occurance. We all get a craving sometimes back me up, ladies. But how about making our own peanut butter cups AT HOME!? Sure, they may contain just as many calories...but they won't contain all the other unknown fillers that I'm not even going to bother to look up-ignorance is bliss? ?...but taking the time to make your own peanut butter and fashion inside some melted chocolate makes it seem not so bad. Doesn't it? Place liners in cupcake pan and set aside. I used regular size liners, but I think next time I'll go to the candy making shop and purchase some shorter ones...for a better presentation. Didn't matter, though...we ate 'em all. Didn't share. To make the filling, puree the peanuts in a food processor for 3-4 minutes, until very smooth. Add the honey, oil, sugar, vanilla, and salt and puree until completely combines, scraping down the sides as you work. 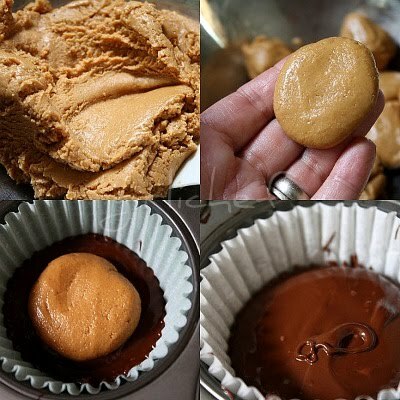 Take ~2 tsp of the peanut butter mixture into your clean hands, roll into a ball, and flatten into a disk that will fit into the center of the cupcake liner but not touch the sides. Shape the remaining 11 centers, distributing pb evenly. Prepare the coating in a microwave safe bowl; heat chocolate on high for 1 minute, stir well w/ fork to distribute heat. Heat one minute more, and stir again. Heat an additional 30 - 60 seconds, stirring thoroughly. The chocolate should be melted and quite satiny, and you should be able to drop it in ribbons from the end of the fork. To assemble the cups, working quickly, spoon about 2 tsp. 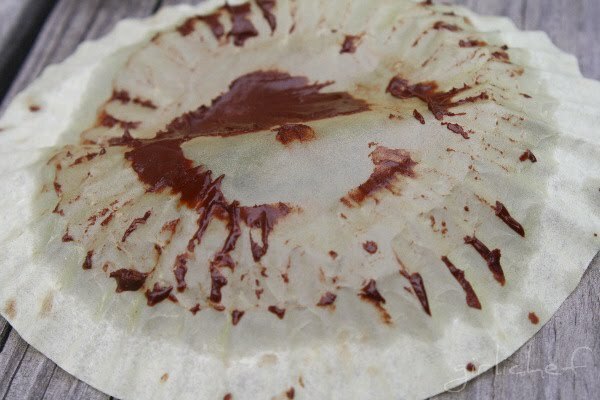 melted chocolate into the bottom of each liner, being careful to coat the bottom in a complete, thin layer, and to coat the sides about halfway up. Gently drop each of the pb disks into the center of a cup, and give it a gentle tap to secure it in the chocolate (but don't push it all the way through to the bottom). Cover each center with an additional tsp. of chocolate, covering the top completely and allowing it to surround the sides of the peanut butter, enclosing it completely. Gently smoothout the tops withthe back of the spoon or by giving the pan a gentle shake. Let sit, undisturbed, for at least 4 hours this is the hard part, until the cups completely harden. How to store them: Devour immediately, or store up to 2 week shyeah, right in an airtight container. Do NOT refrigerate! 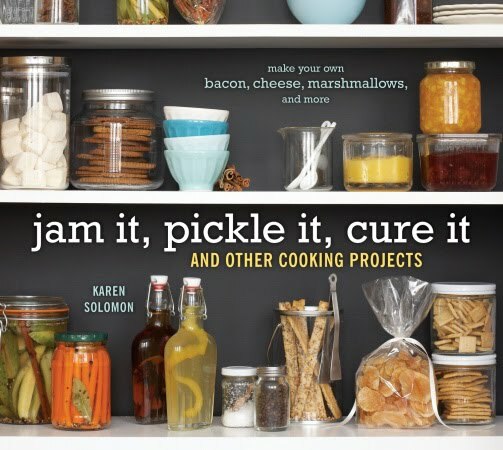 Jam it, pickle it, cure it is packed full of amazing recipes, methods, techniques, tips and funny little intros by Solomon. 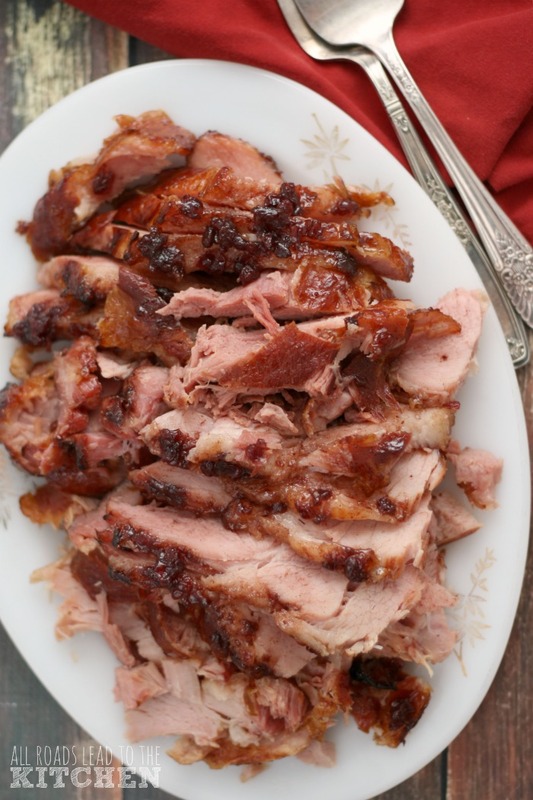 Make everything from beef jerky to jam to marshmallows to pickles to cheese to liqueurs. I LOVE this book and highly recommend it to anyone interested in venturing into the world of making and preserving your own foods...in an easy, fun manner! Remember, any extra copies laying around and sent my way would be well-loved and well-used and highly coveted. Shameless. My very favorite combination! Looks fabulous! How can anyone resist PB and choc???!!! 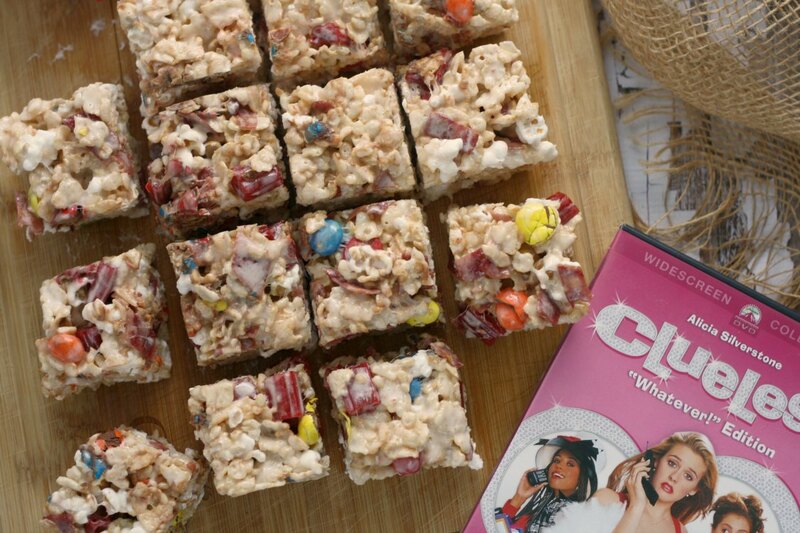 Seriously, Heather- they look soo delicious! Yum! 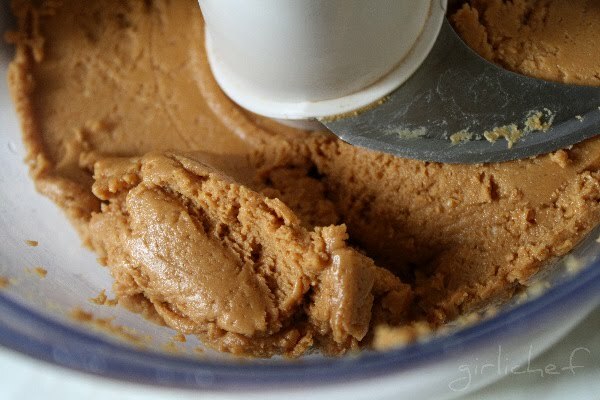 Your blender must be super good to blend that up peanut butter so smoothly! You know I reckon if you tempered the chocolate it would harder much quicker and you would get to chocolate heaven sooner lol! Ha, I like in that add how that girl is casually walking down the street eating a jar of peanut butter. I don't think I've seen anyone do that lol. (No offence to those who do that). What Michelle? You mean YOU don't walk down the street eating peanut butter from the jar!? Pffft, I do that DAILY ;) But you have to watch out, because you totally run the risk of turning a corner and buming into somebody with a gigantic bar of chocolate that's likely to fall smack into your jar! I know - I love this book too!!!! I started putting sticky notes on pages, and then decided the book was just one big sticky note! I love Reese's too...but I actually prefer the eggs/trees etc. They don't have the weird bumpy edges. Don't get me wrong, I eat the edges too. I recently came across a new blog "the suburban settler" that is all about canning, saving, and gardening in suburban areas. I think the lady is from Indiana. I definitely cannot control myself around Reese's. Which really is the only chocolate bar I can say that about. But when you make them yourself, they don't have calories. Or at least, that's what I hear... I like your library cookbook plan. Very crafty. Reese's PB cups were my absolute favorite chocolates - until I developed some sort of PB intolerance and would break out into hives. Seriously one of the saddest days ever when I realized I couldn't have these anymore. 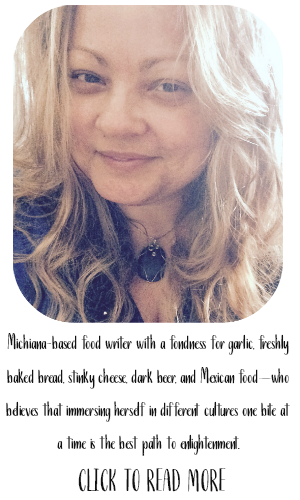 Still, I can look and remember the flavor - I bet your homemade version is fabulous! I do remember those advertisements - I used to love them, and I love peanut butter cups. 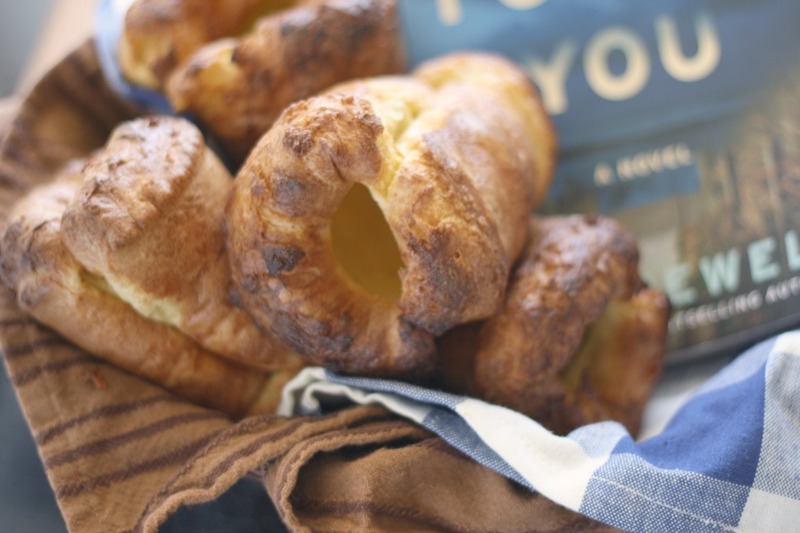 Thank you for sharing your recipe for how to make them at home! These and peanut butter cookies are the only things I've ever enjoyed with peanut butter. I will be making these very soon. LOL - I'm loving that 80's commercial! I totally remember that commercial like it was yesterday, only it wasn't yesterday was it? Yikes! Homemade Reese's!! You're my hero! I'm actually surprised that the pb mix doesn't have more sugar. Definitely way healthier than the store-bought variety! Love the plan for checking the book out from the library! Oh...you are wrong to put up such splendor before 10 AM! Here I am ..sitting home....unable to go outside for another 24 hours and no peanut butter cups around!! Torture! I love those bad boys. One day I am going to put mini Reeses into crescent rolls and bake them. Such goodness. Love your post! OMG! That is simply irresistable, just feel like having a bite from it. Will this recipe work for almonds? OMG, those look absolutely DIVINE!!! Gotta lick that last bit of chocolate off the paper, though! Kim...omg, are we getting old!? Umm...YES! I bet that would be fabulous (I love almonds)...just replace the pnuts w/ the same amount of almonds. YUM! I don't need to be craving chocolates in the morning! These look scrumptious! I am so glad I found your blog today. All your recipes are so inviting and the instructions are so clear. Loved your buttermilk n fruit Popsicle and whole grain artisan bread. 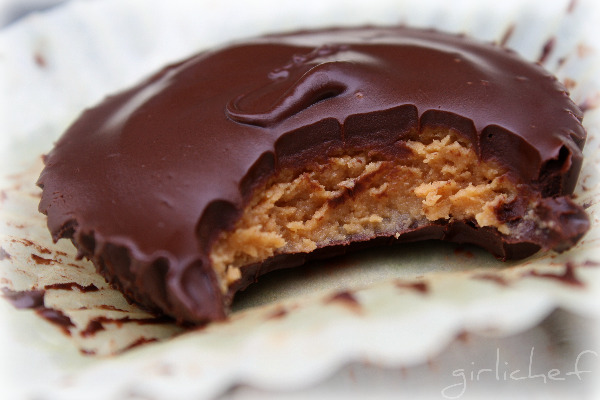 This PB and choc cup is sinfully delicious. Looking forward to connect with you and am subscribing to your feeds. 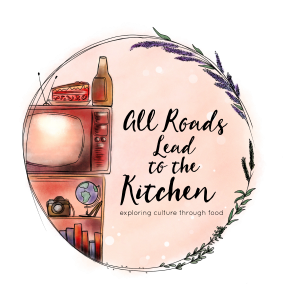 Happy Cooking n Happy Blogging. Heather, you just ruined my diet for the day. :) These look so wonderful. How was the homemade peanut butter compared to the commercial stuff? Alyssa...LOL! Good. Super good. Tasted slightly different, but just as delicious. slightly! I've been wanting to make PB cups for my hubby but have not liked any recipes I've found. Now I'm definitely going to have to try this! Yummy! Thanks for the house warming gift! Seriously I can't wait to try these. I am so craving something like this right now and homemade will always beat the candy by a long shot. Merci girl! One of my all time favorite candies and now you're empowering me to make it myself...evil! I've been on a huge canning kick though so now that I've got a new title to check out I'm super excited! 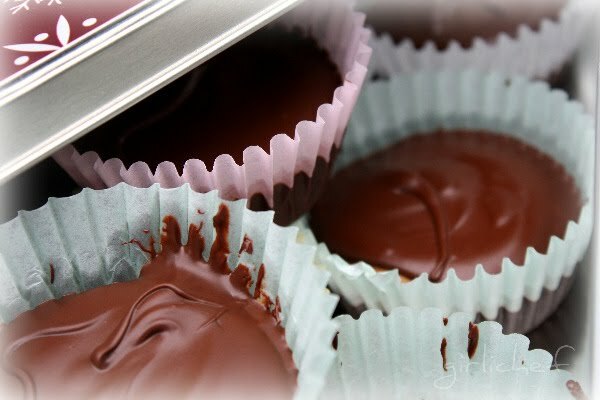 I love peanut butter cups...and you even made your own filling from peanuts...wow..they look sooooo good, and I have coconut oil, begging to be used! Peanut Butter cups have always been my favorite - I tried all the versions and nothing compares to the original! Your homemade PB cups rock! I doubt they would last a day in my house...totally irresistible! These look delicious! 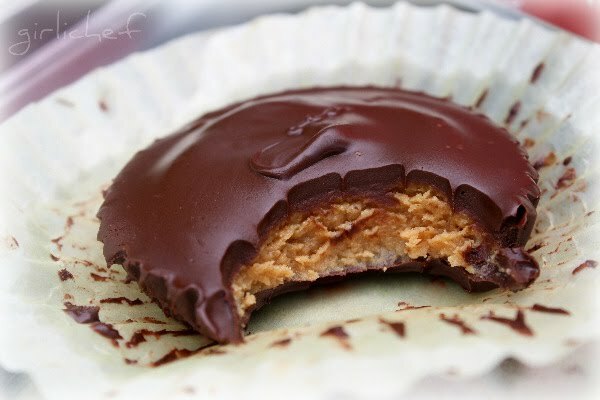 I have been craving PB Cups lately and these are so chocolaty and decadent--yum! Those candies look so insanely good I might have to add them to my long list of food to make this weekend. But I'm home alone, and could end up eating the whole batch. That may or may not be a good thing. A reverse PB cup? really?! I've never been a fan of PB cups- don't throw stones at me! I've always liked Reese's Pieces though. These look amazing and I'd love to sink my teeth into them. yum! You know that I'm totally running off to my library's website in a jiff, darn it, like I need another book to read! But is this one categorized as a jam, pickle, or cure? I'm thinking it must be a cure (for what ails you!). Hehe I love the commercial, so cheesy. 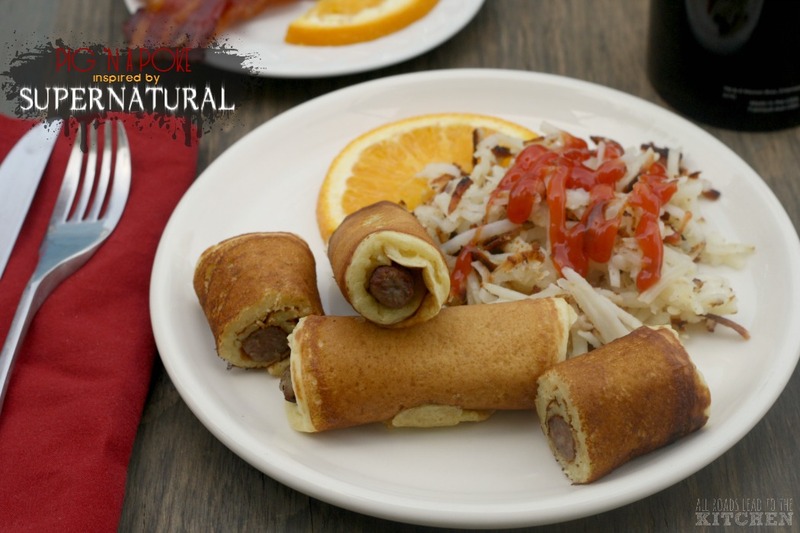 I'll have to get the courage up to make these. We love Reeses PB cups . Thanks for sharing. I've been wanting to make those reese's cups since I can remember. For me as long as it has both, then I'm happy as a kid can be. They look awesome! And of course I remember the commercials! We must quote it like once a week around here!